A few weeks ago we visited the excavations of Pompeii, about 25km from the city of Naples. 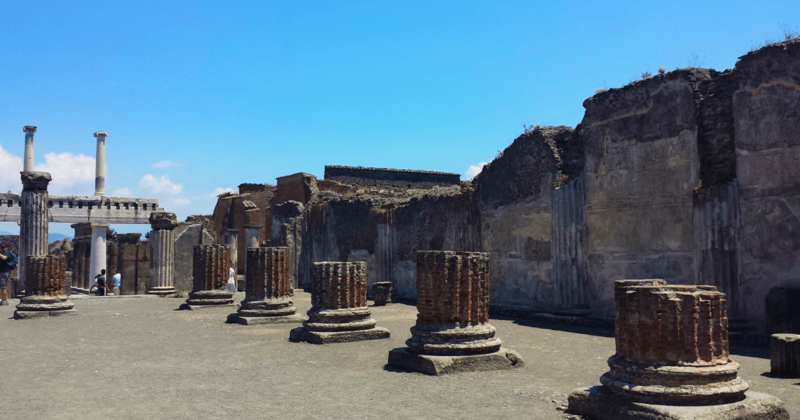 Pompeii is declared a UNESCO World Heritage Site in 1997 and one of the most visited tourist location in Italy. And we completely understand why. The Archaeological site is hard to describe or capture in words. 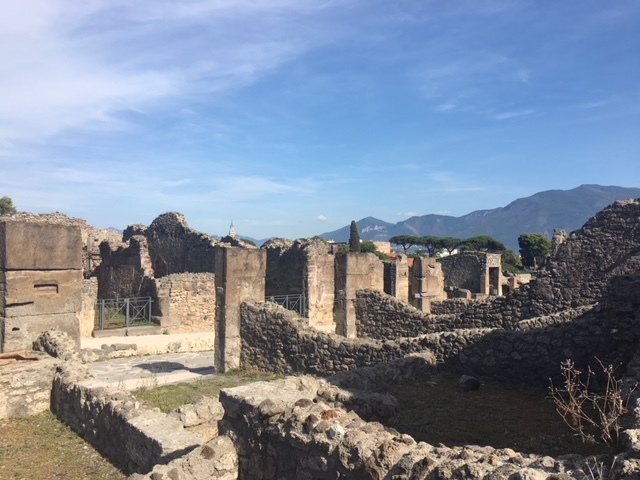 It is filled with history and you will get a chance to see (parts of) the daily life of the inhabitants, until it was destroyed following the great eruption of the Mount Vesuvius, burying the 11.000 inhabitants under tons of ash. The city remained frozen in time, until 1748 when it was discovered by a Spanish engineer. 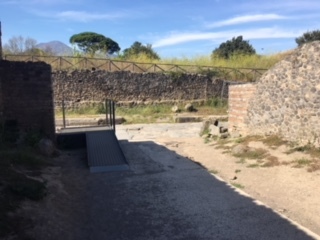 As we get many questions about the accessibility of Pompeii, and we are often asked if a visit and tour is ‘do-able’, we decided to let the pictures speak for itself. Each disability is different, and the opinions differ as well, so this way everyone can make his or her own judgement call, rather than have someone else, including us, make the decision for you. The accessible path has been created a few years ago. By means of ramps the architectural barriers are crossed, in order to create access to the most important areas of the site. Tickets cost € 15 (full price), and especially in the high season it is strongly advised to book your tickets online, prior to your visit. We booked ours fairly late, and were lucky that we could find some last minute. You can add an audio guide to your visit for € 8 per person, or ask for a guided tour with a private tour guide. There is no discount offered for disabled visitors. 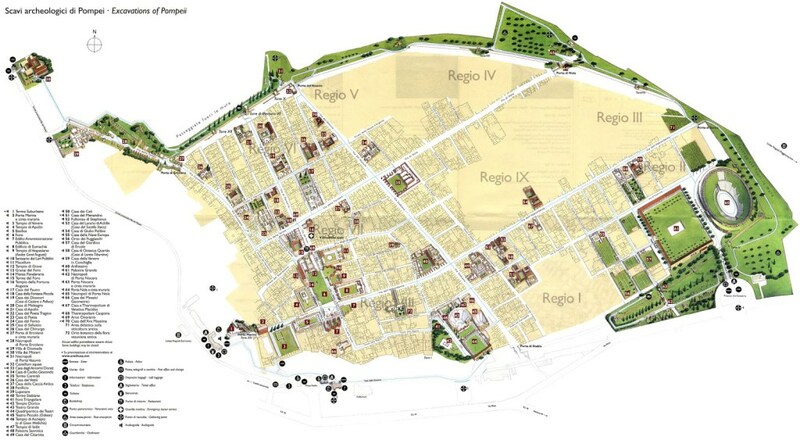 The city of Pompeii is divided into 9 large districts called ‘regions’, distinguished on the map by means of different colors. Each Region is again divided into various blocks, called ‘insulae’ and indicated by Roman numerals. For the able-bodied visitors there are various routes outlines, varying from a 2 hour route to a 7 hour duration. 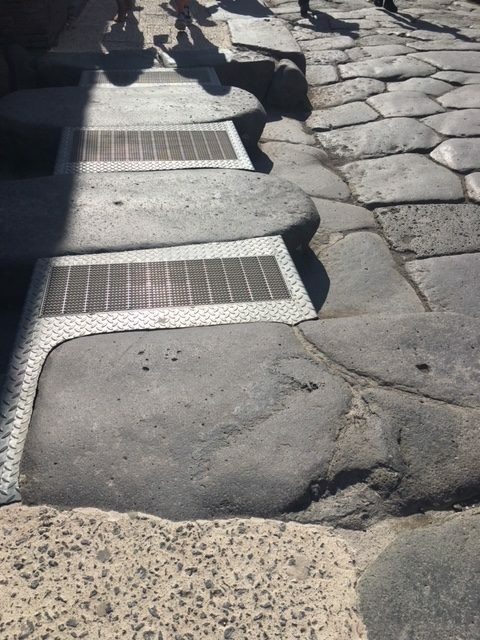 For the disabled visitor there is an accessible route called, ‘Pompei per tutti’, or ‘Pompeii for everyone’. We followed this route. The route has two entry/exit points, and is the dotted blue line on the map. One entry/exit point is at the Piazza Esedra. We entered on the other side, the Piazza Anfiteatro, where you first pass the Anfiteatro, in Region 2. This is the green area, on the right side of the map. Initially the road is flat, and very easy, at the end leading you to the first ramp that marks the beginning of the actual accessible path. As you turn left here, you continue along a very long road, the Via Dell’Abbondanza. 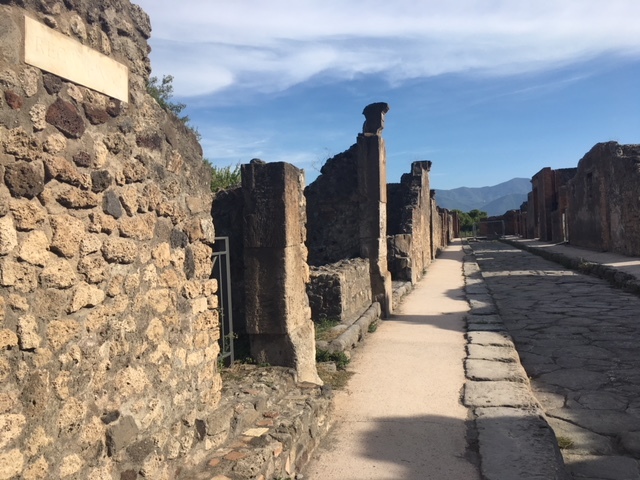 This is basically one of the main roads that divides Pompeii and we followed this from the East part of the city, all the way to the West. 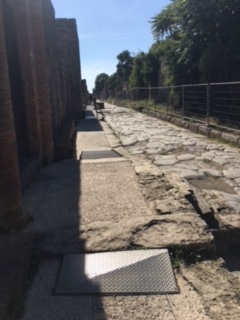 The Via Dell’Abbondanza is quite wide, and has the familiar sidewalks at each side of the street, and the large stoned ‘street’ in the middle. The sidewalk on the left has been made accessible by means of iron ramps where necessary. We had a beautiful sunny day, however although the iron surface is treaded, I can imagine these may be slippery during or after rain fall. 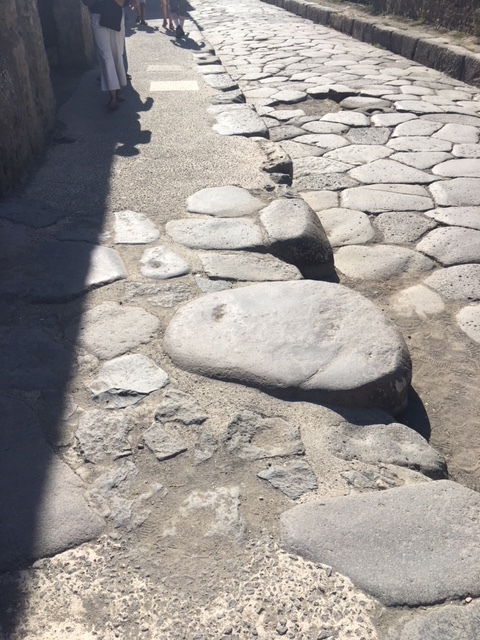 Some crossings of side streets have the bigger rocky stones in the middle as well, and here it may be tricky for some to cross as it is very uneven. The Via Dell’Abbondanza passes along various structures of remains of District ll and l and Vll. Some of the side streets are part of the accessible route, allowing you to make an additional round, to eventually end up again where you started from, the Via Dell’Abbondanza. 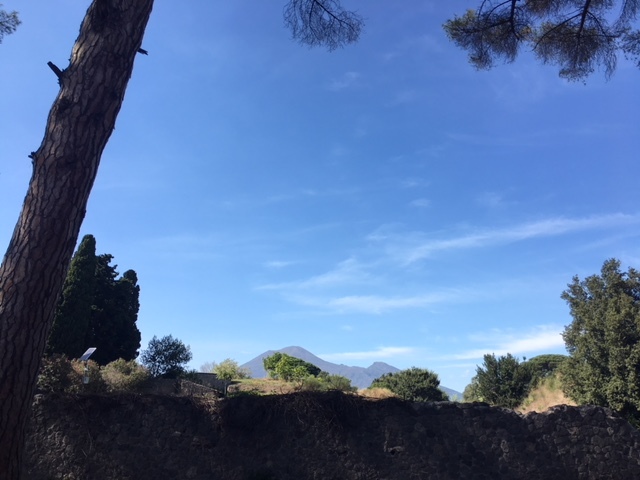 The views and sites along the way are spectacular, especially as the Mount Vesuvius is almost always visible, reminding you constantly of what happened all those years ago and the enormous impact of it. Eventually you end up at the Forum, or ‘Foro’, the economic, political and religious center of Pompeii. The law courts, the municipality and the main temples were grouped around it. The middle area is overall quite flat, and on the right a ramp is created to access the way that eventually leads to the temple of Jupiter. At some point you will need to return again to where you started from as it becomes inaccessible due to the uneven road, steps and big stones. When visiting in the midst of summer, beware that there are hardly any places of shade to be found here, so be prepared for some serious heat! From the Forum you can continue on the Via Marina, and eventually exit through the Piazza Esedra/Porta Marina. 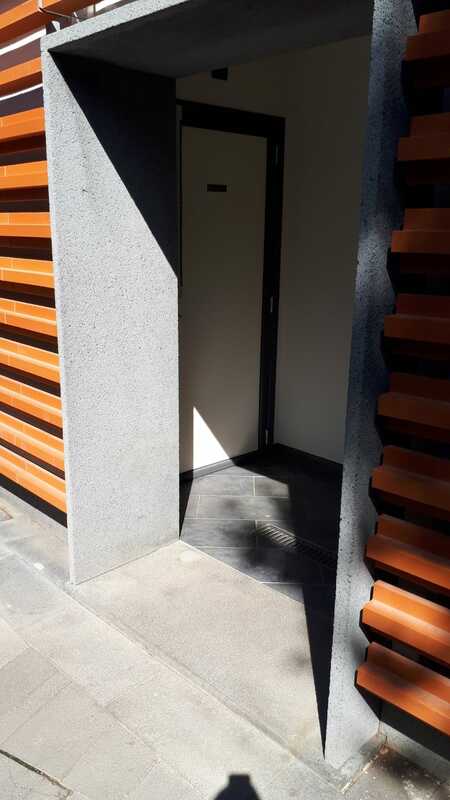 There are four accessible toilets: one at the Porta Marina Superiore, at the Porta Marina Inferiore, the Villa Imperiale and one at the other entry point, the Piazza Anfiteatro. This is our entry point, however the toilet was closed at time we were there, accessed with a key to ask from the staff. 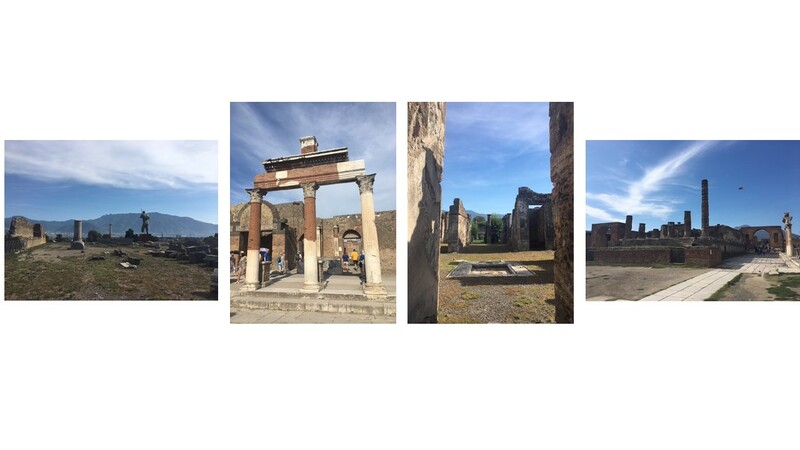 All in all you can spend a good couple of hours in Pompeii, and I am sure we have missed a few highlights. The lay out is quite big, as any small to midsize city, and you can admire the artifacts everywhere you turn and look. Make sure to prepare for all kinds of weather, depending on the time of year of your visit. Ready to explore Pompeii? 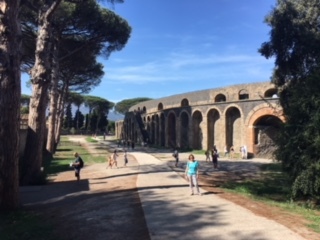 Contact us at Disabled Accessible Travel for more information and advice, on how best to visit Pompeii and possible precautions to take into consideration prior to your visit.